I happened upon this recipe when I was looking up other uses for fennel besides in my fruit/vitamin infused lemon water and in soups. And…this one just came out perfect! So creamy and delicious, with absolutely NO milk in it! It came out so good that I have to share this recipe with everyone. Or you can just use the copy and pasted verison below. Surprisingly enough, I didn’t change one thing about this recipe, everything I did was exactly what the original recipe called for, and that never happens! Have fennel lying around but not sure what to do with it? Well, if you’re up for something new – try throwing a bit of it into your smoothie today! 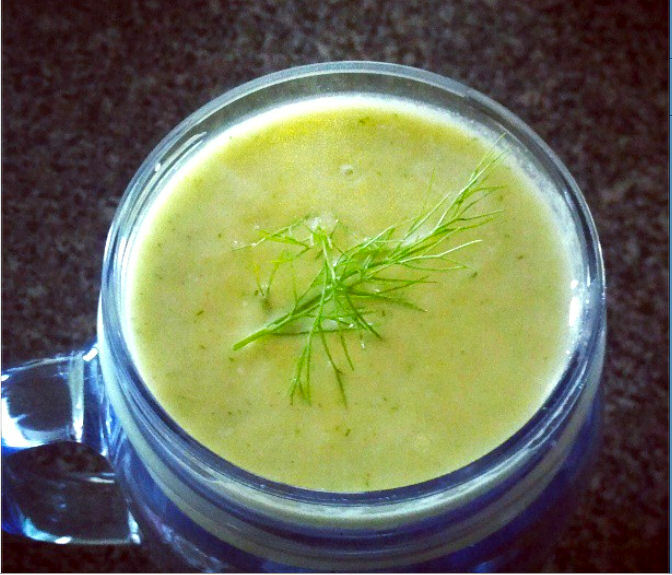 Fennel is a source of plant based iron, and has long been used as a remedy for upset tummies, gas & indigestion. Even though it smells like licorice, the taste is a bit different and really subtle in a smoothie combo with pineapple and avocado. Warning though, if you don’t have a high speed blender, you’ll want to really chop the fennel up into small bits because it doesn’t blend well in a regular blender. You can also just slice it up and throw it in a salad or a stir fry! Instructions: Blend all ingredients on high until smooth. Use less water to start and add into your blender until you reach the right consistency for your preferences.